We developed this lamp in order to pack the maximum candlepower into a small headlight. Most of the cool aftermarket halogen lamps are too bulky to fit into a small housing, so we came up with our own. 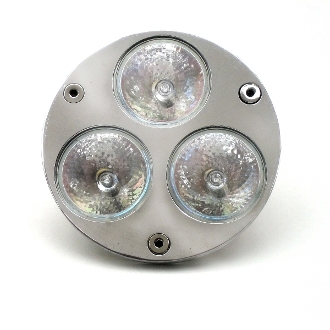 This unit has a chromed aluminum mount base that holds three 12 volt halogen lamps. All three lamps are rated at 75 watts. Uses two lamps for the low beam for a wide beam, one lamp for the high beam as a narrow 12 degree spot. This item measures approximately 4.5" wide X 3.0" high.